Apologies having some issue with After Effects so gifs will have to wait. First video attempt had other audio so only screen shot to show this wasn't a freak accident. Not that Abruzzi AP is always this deficient vs d'Aosta. Another that shows d'Aosta significantly better thanks to a citadel. Also note ease at which extremities are hit for damage. Can you do one on the Roma too? My decision to pass on this one has been further reinforced. Not sure why but sure, I guess I hate my life now. Another that shows d'Aosta significantly better thanks to a citadel. That would just be depressing. Roma's dispersion was set at special. I am just waiting for the song and dance that allows similar soviet rifles to have excellent grouping. I mean we already have Italian cruisers tiered over their much younger design counterparts. So out of curiosity my horrible aim made it three salvos. I'm sure the people who actually test this stuff have tons of footage if you want it. No thanks, I've already moved on. If it makes you feel any better Fiji should only really have 89mm instead of 114mm armor - and 114mm is pretty decent at T7 despite her 'light' classification by gun size. Overall though, interesting to see the difference around a threshold point, though a little bit of the difference is more shots not hitting the main belt for overpens or '33's in the upper hull. Despite having nominally a newer gun with a higher caliber, the initially shell speed is 100m/s less on the Abruzzi and (as shown) the penetration suffers accordingly. Somehow WG also decided the Abruzzi needed 100 less alpha damage per shell too. Abruzzi has better dispersion and HE shells. No idea why they decided to screw the AP shell with less Krupp and higher air drag. Looking at navweaps it should be the other way round? Maybe they confused the poor HE shell ballistics with the AP shell? 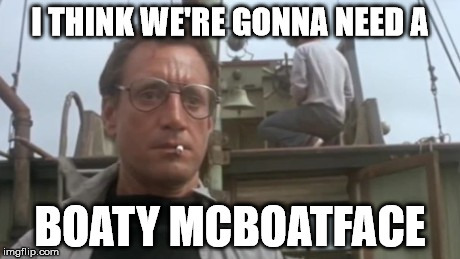 The STs have been saying that the ship was a hot plate for a while now, and people should keep it their hands off. No idea why some candy cane striping warrants such a crazy load of apologists. There ARE good Italian boats to be played, but d'Aosta is utterly unimpressive, and Abruzzi is garbage, and people just need to reconcile themselves to that fact (and the fact that both ships were arguably overtiered). I'm fine with Fiji having the backing plate. To your point I did a couple of further videos. One of the complaints I found on the Italian navy was that the 50kg AP round was never modernized for the Abruzzi class. So I'm really at a loss for WG's insistence at the lack of efficiency for AP a tier higher. Does this happen with the repeated Japanese 8" rifles over several tiers? HE in the video is IFHE + DE. As far as the A+ goebels dehumanizing effort by another poster. If I where to be crying over spilled milk this is what I would say. The reality is despite the launch date the Abruzzi class is pretty much fresh off the drawing boards after the 4th series, it is a radical departure as it follows more international trends in machinery at the time. 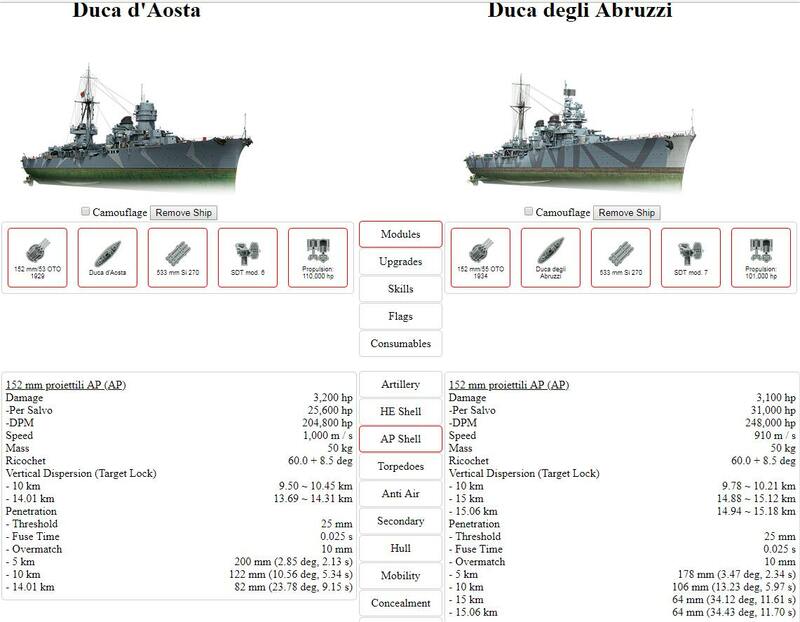 If WG wanted a tier VII Italian light cruiser a more honest approach would have been modernizing the Abruzzi with planned changes in the Ciano class, follow on version of the Abruzzi class where authorized in the naval budgets. Finding drafts for such might be a miracle. Keeping the Abruzzi's modified Pugliese tower instead of the more UK bridge structure as I'm sure the fire director that tall would make pre-nerf Pensacola feel tiny. If that seems wrong let's just remember De Grasse says hello. Or WG could have just gone crazy and done an Abruzzi with 4 x 3 135/45 DP turrets as proposed post war and let Abruzzi join the USN CL's in hill hugging. An Alpino's ship all the way. Once again that time has passed so who cares. This is all about TTK or WG's most famous buzzword. EfficiencyBalansMarked. We already know the source material was a Russian book for the in game model of Abruzzi. I'm not here to fight any battles. WG buffs French and Japanese HE. German AP. British HE. Etc. Italians seem to be about making Russians look good. Budyonny which is an Abruzzi with better 152mm rifles and AA which was a design study from after Abruzzi sits a tier lower. Maybe just maybe since HE properties of Italian shells seem to be this games version of .50BMG vs 20mm Minengeschoss good old WG might call a time out and think about things? Abruzzi needs efficiency at the 10km range not 8km as a person on Reddit suggested. There is no difference in their accuracy. There is no difference in their HE shells. Scratch that, there are minor differences in their HE shells -- I stand corrected. Abruzzi has 955m/s muzzle velocity vs 950m/s on d'Aosta. However, d'Aosta has better shell drag. Wow, sign me up for that ugly duckling. I want that thing in my port. You need to git gud and stop whining about ships. 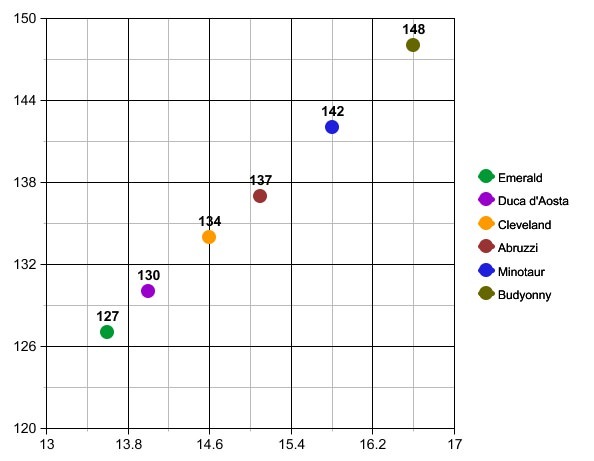 Min vertical dispersion has nothing to do with ship accuracy. It's a value used to prevent ships from shooting themselves with wonky dispersion at very close ranges. Horizontal dispersion scales in a linear fashion over distance with most light cruisers having the same dispersion arc. Here's some light cruisers. Abruzzi without ASM1: 137m @15.1km. Here they are plotted on a graph. It's close enough to be within a rounding error's worth of difference. As is, if you play the Abruzzi then don't make any mistakes. She won't survive it.